Overall Responsibility: Serves as the presiding officer of the association and exercises all duties and responsibilities commonly associated with this office except as limited by the AAA bylaws. The President represents the association in all matters. All actions of the President are the actions of the organization as a whole. In addition to specific responsibilities and qualifications noted in the Executive Board member job description, additional responsibilities and requirements specific to this office are noted below. Calls the meetings of the Executive Board. Establishes the agenda for, and preside at all meetings of the Executive Board. Appoints members to special committees, commissions, taskforces, and working groups. Calls and presides over the annual business meeting of the membership. Participates in the development and implementation of short-term and long-term strategic planning for the association. Serves as a principal spokesperson for the organization. Serves as AAA representative at any section meetings and/or other relevant association or external organization meetings. Serves as an ex-officio member of AAA committees (excluding nominations committee). Term of Office: Two-year term as president. Qualifications: Same as Executive Board member. Overall Responsibility: Assumes duties in the event of absence, death, resignation or incapacity of the President. Exercises all duties and responsibilities commonly associated with this office. In addition to specific responsibilities noted in the Executive Board member job description, additional responsibilities specific to this office are noted below. Serves as Chair of the Executive Board Long Range Planning committee. Represents AAA at the President’s request. In the absence of the President, fulfills those duties as noted in the President’s job description. Carries out such other duties as may be assigned by the President or by the Executive Board. Selection: The President-Elect/Vice President is elected by the membership at large. Term of Office: Two-year term. Requirements: Same as Executive Board member. Overall Responsibility: The secretary is the corporate secretary and as such exercises all duties and responsibilities commonly associated with this office. In addition to specific responsibilities noted in the Executive Board member job description, additional responsibilities specific to this office are noted below. Responsible for minutes of Executive Board meetings. AAA practice is to assign staff to take the minutes at Executive Board meetings, assisted by the secretary as needed. Certifies results of all Association-wide elections. Serves as Chair of the Nominating Committee. Selection: The Secretary is elected by the membership at large. Term of Office: Three-year term. Maintain knowledge of the American Anthropological Association bylaws, structure, activities, and processes. Maintain a personal commitment to its goals and objectives. Meet at least once annually and at such other times as may be deemed necessary. Serve as a member of the Association Operations Committee or the Association Operations Committee. Appoint, set objectives and parameters, and evaluate the Executive Director. Appoint the Association Treasurer, and the Editors of the American Anthropologist and other association special publications and monographs. Authorize committees, define their duties, receive their reports, and take action as required. Authorize the establishment of new AAA Sections and Interest Groups, and create the policies and procedures for their continued maintenance. Appoint representatives to other bodies, define their duties, and receive their reports. Establish association public policy positions. Authorize revenues and expenditures of Association funds through the annual budget process or as needed during other times of the year. Establish appropriate fiscal policies and controls. Selection: Executive Board members are elected by the membership at large. Requirements: Executive Board members will abide by the association's Conflict of Interest Policies and will annually sign the conflict of interest statement. Candidates for election to the board must be voting AAA members. Previous leadership experience, in AAA and/or its Sections, either appointed or elected. Objectives: To organize materials and recommend candidates for all open, elected AAA positions. The Members’ Programmatic, Advisory and Advocacy Committee (M-PAAC) is convened by the Executive Board for the purpose of responding to AAA member needs and interests, with a particular focus on the key areas of ethics, human rights, labor and workforce, public policy, racialized minorities, gender equity, the practicing-applied-public sector, and world anthropologies as these areas relate to anthropology, anthropologists and the Association. Human Rights Seat: Promote, protect and expand the definition of human rights within an anthropological perspective; mobilize anthropologists support for human rights; develop an anthropological perspective on human rights; consult with other entities on human rights violations and the appropriate actions to be taken; and encourage research on all aspects of human rights from conceptual to applied. Ethics Seat: Design and implement the Association's ethics education and advisory program, which includes: providing ongoing education in ethical issues for all AAA members; providing advice to AAA members facing/raising ethical dilemmas; and providing guidance to the Executive Board about AAA codes and guidelines. 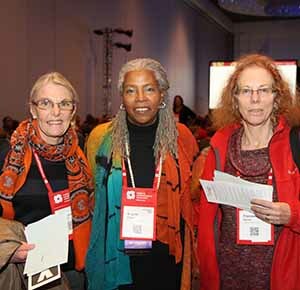 Gender Equity Seat: Monitor the status of gender equity in the discipline and the American Anthropological Association; and advise the Executive Board on the status of gender equity in the discipline and the Association to educate members. Labor Seat: Provide information about labor conditions of untenured anthropologists in US colleges and universities; advise the Executive Board on appropriate actions on the basis of that information; monitor labor conditions in AAA Annual meetings venues; and provide the Executive Board information on labor conditions as requested. Minority Issues Seat: Foster professional advancement of U.S. racialized minorities in anthropology and attract such minorities to and retain them in the discipline and the Association; promote intellectual awareness within the discipline and Association of issues that face such minority anthropologists; and help define anthropology's role in U.S. discourses on racism. Practicing Seat: Explore and engage the range of issues that have emerged or are emerging as a result of the increasing employment of anthropologists outside of the academy doing work as practicing anthropologists, applied anthropologist and anthropologists in the public sector. Public Policy Seat: Enhance the participation of AAA entities and members, and the visibility of contributions by anthropologists in the area of public policy. World Anthropologies Seat: Develop clear objectives for drawing US and international anthropologists together; promote awareness of different anthropological practices and traditions; and foster cooperation between anthropologists and anthropological associations in different countries. Meetings and Schedule: In person once a year at the annual meeting and via conference call as needed.